When talking about the most successful female executives and business owners, you must mention Aryn Drake-Lee. Aryn did not have much attention from the media until word about her divorce with ex-husband Jesse Williams got out in 2017. Her marriage with Williams was modelled as one of the best unions in Hollywood until information about their divorce spread like wildfire. While many have quizzed into the sudden divorce of the former sweethearts, others who are just getting to know about them have further questions about their identity or profile. For those who do not know, Aryn’s ex-husband is the popular actor, director and producer Jesse Williams who is known for his role as ‘Dr. Jackson Avery’ on Grey’s Anatomy. It is important to note that Williams and Aryn met long before they both rose to fame. Who is Aryn Drake-Lee, the Ex-Wife of Jesse Williams? Aryn Drake-Lee is a renowned real estate owner from Los Angeles, California. She schooled at the French American International School, after which she proceeded to college afterwards at the Barnard College, a private women’s liberal arts college in New York City. Aryn who is of mixed ethnicity speaks English, French and Spanish. She is known for her signature natural hair which she always leaves in its curls and elasticity. Her journey to wealth started when she began working at Web and Brooker, a black real estate management company located in Harlem. Aryn found her forte in the real estate line of business and gradually started building hers. She worked herself to wealth, taking New York by storm and becoming one of the most successful brokers in the Brown Harris Park Slope. Through her daring and mindblowing ventures, the goal-getter pushed Web and Brooker to great heights in the 80s, making it one of the biggest black management companies in the US at the time. Reports have it that at the age of 24, she had already purchased tons of properties. Everyone needs love indeed; Aryn and Williams, as a matter of fact, were not ready to disprove the notion when they met in their humble days. What started out as a platonic friendship in no time metamorphosed into a romantic experience and both Drake-Lee and Williams knew they were made for each other. This brings us to the part where the entire public has quizzed into; the circumstances surrounding the divorce of these two lovebirds, Aryn Drake-Lee and Jesse Williams. In one of his interviews, Williams said that he met Aryn Drake-Lee while he was still a teacher who taught history. Aryn and Williams who had their life going on for them became friends at the time but later began a romantic relationship. Though he was a teacher, Williams had dreams of becoming an actor. The aspiring actor also studied acting later on and had moved to California to scout for movie roles. Lovestruck Aryn had agreed to join him and moved with him to the city. Their love was stronger than anything and in 2012 the couple who had already dated for five years felt the time was right to seal the deal. The two soon tied the knot in Los Angeles on September 1, 2012, in an awe-inspiring ceremony with family and friends present. They welcomed their first child, daughter – Sadie Williams in 2013 and in 2015, they welcomed a son – Maceo Williams. While they were still together, the couple co-founded a business -Ebroji App. Ebroji’ GIF Keyboard App organizes GIF into different categories like; ‘Feeling Myself’, ‘Awkward’, ‘Eye Roll’ and tons of others. The app which designed looks and sounds like the user regardless of race was a massive hit that of course added to the pockets of the masterminds. Both Aryn Drake-Lee and Willimas have been very private about their personal life before and after their marriage, making it difficult for the media to find out the true reasons behind the failure of their marriage. Questions started arising even while they were still married, as Drake-Lee hardly made any public appearances with her then husband. But the speculations were always suppressed by loved-up photos of them dispersed all over various media platforms, as well as Jesse’s open admiration and appreciation of his wife in his interviews. But something still seemed wrong between the two. All doubts were confirmed in 2016 when the couple filed for a divorce. 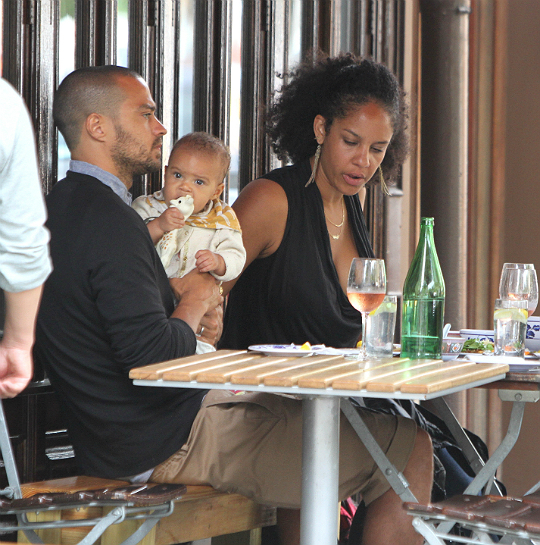 Several reports had it that the reasons for the divorce revolved around infidelity on the part of Jesse Williams. However, these rumours were refuted by Williams who trashed them on various platforms, as well as on famous rapper JAY-Z‘s short film Footnotes for his 4:44 album. Alongside other celebrities like Will Smith, Chris Rock, Kendrick Lamar, Aziz Ansari, Anthony Anderson, he talked about issues of love, relationships and life. Although he did not mention his estranged wife’s name, Williams addressed the cheating allegations making rounds in the media. The actor bemoaned the unpopular idea that he threw away his 13-year relationship with a woman he loved with all his heart, all because he met a colleague who was cute. The couple finally divorced in September 2017. The litigation process soon turned into a battle as Drake-Lee wanted sole custody of the two children. The real estate guru, who cited her estranged husband’s rascality with women and drink, said he was not fit to take care of the kids. But in a rebuttal, Williams claimed that Aryn restrained him from seeing or spending time with the kids. However, after much ado, the court settled the case with equal custody of the children for both parents. The Grey’s Anatomy star was also asked to pay $50,695 for support of his family.